Ready to join our Mastery University family? 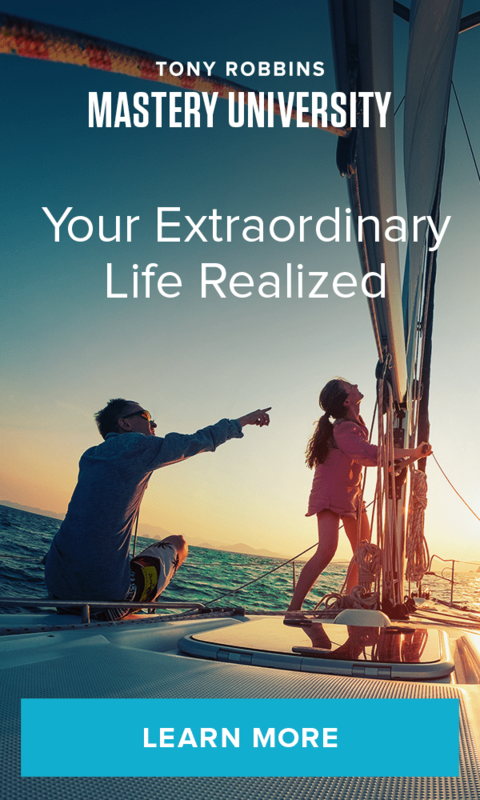 Mastery University promotes life-long learning to help you create your most extraordinary life. Immerse yourself at 4 of Tony’s most life-changing live events, learn new skills directly from Tony Robbins and his hand-selected experts and receive 1:1 coaching, so you can finally master all aspects of your life – mind, body, emotions, physical health, finances, time and business. Created with flexibility in mind, you can customize your journey to attend events in the order that works best for your life and schedule. These is no set order – you pick what’s best for you! Receive strategies and insights to take control of your health and well-being, with exclusive access to Tony’s hand-selected speakers and experts in the field. Discover the top 4 guiding principles that Tony learned from his interviews for Money: Master the Game. Get exclusive access and financial tips from Tony’s personal financial advisor, Ajay Gupta. Your Mastery University package includes six 1:1 coaching sessions. Keep your momentum going after and between your live events with your own dedicated 1:1 Results Coach. Trained in Tony Robbins proprietary tools and methodologies, your Results Coach helps you breakthrough limitations, set new goals and keeps you accountable. From mindset to accountability, strategic thinking to execution, your Results Coach is always there to help you reach your peak. Ready to join or want more information? Complete this form or call 858-713-8299 and Mastery University Representative will connect with you to provide any additional details you need.